Malaria is a life-threatening blood disease caused by parasites transmitted to humans through the bite of the Anopheles mosquito. Once an infected mosquito bites a human and transmits the parasites, those parasites multiply in the host's liver before infecting and destroying red blood cells. The disease can be controlled and treated if diagnosed early on. Unfortunately, this is not possible in some areas of the world lacking in medical facilities, where malaria outbreaks can occur. Researchers are working hard on improving the prevention of malarial infection, early diagnosis and treatment, with just one malaria vaccine close to being licensed so far. Malaria is caused by the bites from the female Anopheles mosquito, which then infects the body with the parasite Plasmodium. This is the only mosquito that can cause malaria. The new malaria parasites are then released back into the bloodstream when they infect red blood cells and again begin to multiply. Some malaria parasites, however, remain in the liver and are not released until later, resulting in recurrence. very year, more than 125 million people visit over 100 countries endemic for malaria. Each year up to 30 000 travelers are estimated to contract malaria and late or wrong malaria diagnosis in their home country may make things worse for them. Fever occurring in a traveler within three months of leaving a malaria-endemic area is considered a medical emergency and should be investigated urgently. As there is no vaccine available for protection against malaria despite decades of research, there is a need for an alternative method that offers a fairly reliable protection against malaria. And as malaria can be severe in the non-immune, all visitors from non-malarious area to a malarious area should be protected. Anti malarial drugs offer protection against clinical attacks of malaria. 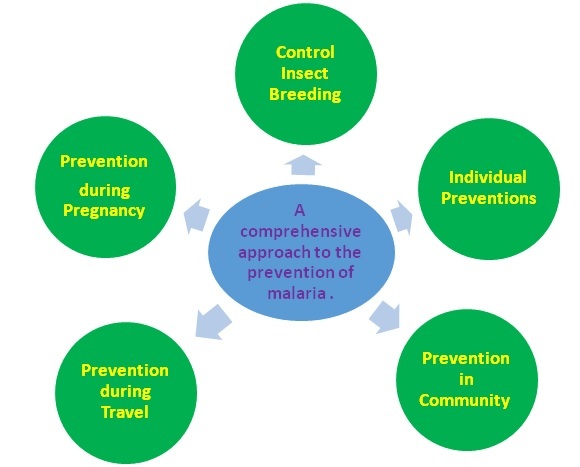 The risk of contracting malaria depends on the region visited, the length of stay, time of visit, type of activity, protection against mosquito bites, compliance with chemoprophylaxis etc. Pregnant women, infants and young children and people who have undergone splenectomy should avoid travel to a malarious area as these people are at higher risk of severe malaria. If travel is unavoidable, these people should take strict precautions to avoid mosquito bites and also take adequate chemoprophylaxis without fail. Use of anti-malarial drugs to prevent the development of malaria is known as chemoprophylaxis. The choice of chemoprophylaxis varies depending on the species and drug resistance prevalent in a country. It must be remembered that no chemoprophylaxis regime provides 100% protection. Therefore it is essential to prevent mosquito bites as well as to comply with chemoprophylaxis. A possibility of malaria should be considered if a febrile illness develops after a week of entering a malarious area as well as up to over a year after visiting such an area, although it is more likely within the first 3 months of return. Other residents of a malarious area are not advised chemoprophylaxis. It should not be prescribed as a remedy to prevent re-infections in an endemic area. Primary Prophylaxis: Use of antimalaria drugs at recommended dosage, started 2-20 days before departure to a malarious area and continued for the duration of stay and for 1-4 weeks after return. Causal prophylaxis: This prevents the establishment of infection in the liver by inhibiting the pre-erythrocytic schizogony. Primaquine and proguanil are effective as causal prophylactic drugs. Potential adverse effects on long term use and non-availability of primaquine make it a difficult drug for this purpose. In one study in the Papua- New Guinea, it was found to be effective as a prophylactic agent. It is however not yet recommended for general use. Daily doses of proguanil provide causal prophylaxis in areas where resistance to this drug is not present. Terminal Prophylaxis: Terminal prophylaxis is the administration of primaquine for two weeks after returning from travel to tackle the hypnozoites of P. vivax and P. ovale that can cause relapses of malaria. It is indicated only for persons who have had prolonged exposure in malaria-endemic regions, such as expatriates and long-term travelers like missionaries and Peace Corps volunteers. Primaquine is administered after the traveler leaves an endemic area and usually in conjunction with chloroquine during the last 2 weeks of the 4-week period of prophylaxis after exposure in an endemic area has ended. Children are over-represented in the incidence of malaria in the UK, probably because completely susceptible UK-born children accompany their overseas-born parents on visits to family and friends in endemic areas. Malaria in children (and sometimes in adults) may present with misleading symptoms such as gastrointestinal features, sore throat or lower respiratory complaints; the diagnosis must always be sought in a feverish or very sick child who has visited malaria-endemic areas. Children can be treated with most of the antimalarial regimens which are effective in adults, with appropriate dosage adjustment. Doxycycline plus quinine should not be given to children under 12 years as doxycycline is contraindicated in this age group, but clindamycin can be substituted for doxycycline, and pyrimethamine–sulfadoxine (Fansidar®) may also be an effective substitute. An acute attack of malaria does not confer protection from future attacks: individuals who have had malaria should take effective anti-mosquito precautions and chemoprophylaxis during future visits to endemic areas. Available in multiple dosage forms and strengths, doxycycline tablets or capsules of 100 mg are most often used for malaria prophylaxis or treatment. Tablets or capsules should be swallowed with an adequate amount of fluid and should be taken with food. Intravenous (IV) formulation is available for patients unable to take oral medications for treatment. For IV, avoid rapid administration. Prophylaxis: 100 mg base once daily starting 1–2 days before travel, then daily during travel, and daily for 4 weeks after leaving the malarious area. Treatment: 100 mg twice a day for 7 days; must be used in conjunction with a fast acting schizontocide. Primaquine is also required if treating P. vivax or Plasmodium ovale. For children ? 8 years of age. Prophylaxis: 2.2 mg/kg (up to adult dose of 100 mg) daily starting 1–2 days before travel, daily during travel, and daily for 4 weeks after leaving the malarious area. Treatment: 2.2 mg/kg (up to adult dose of 100 mg) twice a day for 7 days; must be used in conjunction with a fast acting schizontocide. Primaquine is also required if treating P. vivax orP. ovale. Prophylaxis: Protective efficacy of doxycycline has been shown in three randomized placebo-controlled trials to be between 92% and 96% for P. falciparum and 98% for primary P. vivax infection. Treatment: When used in combination with a fast acting schizontocide, treatment efficacy of doxycycline has been shown to be 96–100% in three open-label trials. Limited data suggest that milk and other dairy products may limit the bioavailability of doxycycline. It is recommended to separate doxycycline and ingestion of dairy products by 2–3 hours. Most common mild/moderate adverse drug reactions (ADRs): nausea, vomiting, abdominal pain, photosensitivity, and vaginitis. Women prone to candidal vaginitis should consider carrying a self-treatment course of an anti-fungal. Severe ADRs are uncommon and include esophagitis and esophageal ulcerations. Doxycycline monohydrate has been observed to have less gastrointestinal side effects than doxycycline hyclate. Doxycycline is contraindicated in those who have known hypersensitivity to tetracyclines. Decreased absorption of doxycycline can occur if taken concurrently with medications with divalent or trivalent cations such as antacids, laxatives, and oral iron preparations. Although the current FDA label states “concurrent use of tetracycline may render oral contraceptives less effective,” recent studies have failed to show a significant association between oral contraceptive failure and tetracyclines. Tetracyclines may potentiate the effect of oral anticoagulants, therefore patients on oral anticoagulants should have prothrombin times monitored closely and dose adjusted as needed. Concurrent use of tetracyclines and methoxyflurane anesthesia is not recommended. Barbiturates, carbamazepine, and phenytoin decrease the half-life of doxycycline. Pregnancy category D: Do not use in pregnancy except for the treatment of life-threatening multidrug-resistant P. falciparum when no other treatment options are available. Not recommended for children < 8 years of age. Excreted in low concentrations in breast milk; noted to be compatible with breastfeeding by the American Academy of Pediatrics. Doxycycline is a broad-spectrum bacteriostatic agent synthetically derived from naturally occurring tetracyclines produced by Streptomyces sp. bacteria.3 Doxycycline was invented and clinically developed in the early 1960s by Pfizer Inc., New York, NY, and marketed under the brand name Vibramycin. Vibramycin received FDA approval in 1967, becoming Pfizer's first once-a-day broad-spectrum antibiotic. The additional indication for malaria prophylaxis was obtained in 1994 with a supplemental New Drug Application. Tetracyclines were first reported efficacious against drug-resistant malaria in the 1970s.4,5 Early studies examined the effectiveness of tetracycline, minocycline, and doxycycline as antimalarials.4–8The evidence for minocycline beyond these early studies is limited, and the four times per day dosing of tetracycline may make adherence difficult. Of the tetracyclines, doxycycline has the most evidence for its effectiveness as an antimalarial. Doxycycline can be used by travelers to all malaria-endemic areas for malaria prophylaxis. When used in conjunction with other medications, doxycycline can also be used to treat malaria. Doxycycline can be used for the prevention of malaria in travelers to malaria-endemic areas and is a good option for areas with chloroquine or multidrug-resistant P. falciparum. For prophylaxis, doxycycline is taken once daily beginning 1–2 days before travel, while in malarious areas, and for 4 weeks after leaving. Daily dosage for children ? 8 years of age is 2.2 mg/kg (not to exceed the adult dose of 100 mg) and for adults 100 mg.
Doxycycline should always be used in conjunction with another drug for treatment of malaria. Quinine with doxycycline can be used for uncomplicated malaria caused by chloroquine-resistant P. falciparum or P. vivax. When used for severe malaria doxycycline should be used with intravenous quinidine. The treatment dose of doxcycyline in adults is 100 mg twice a day and for children 2.2 mg/kg twice a day up to a maximum of 100 mg twice daily. For those unable to tolerate oral medications, doxycycline is available in a parenteral form and can be made in concentrations between 0.1 and 10 mg/mL. If pain occurs while receiving doxycycline intravenously, it is recommended to use more dilute concentrations (no lower than 0.1 mg/mL) infused at rates no higher than 1 mg/min9; switch to an oral formulation once the patient is able to tolerate medications by mouth. If treating P. vivax or P. ovale, in addition to the aforementioned drugs, primaquine must also be given to prevent relapses (see Pharmacodynamics section). 2. Soon we could have a malaria vaccine: A cheap, effective vaccine would help in reducing a significant burden of malaria and we are not very far away from having one. Researchers at the University of Edinburgh have identified a method to produce key proteins of the malaria parasite in a faster way. These proteins when used in the vaccine would trigger production of antibodies and offer protection against malaria. This research has significantly contributed to the development of cheaper malaria vaccine, which is the primary requirement for majority of the population prone to malaria. 3. A novel method to control spread of malaria: Anophelesmosquito is the main carrier of malaria parasite. 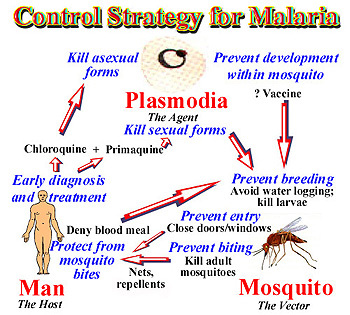 So, to control the spread of malaria it is important to prevent breeding of these mosquitoes. Scientists from Harvard School of Public Health, the University of Perugia and Imperial College London, found a method to interfere with fertility of the female Anophelesmosquito. This interference affects reproduction of the mosquito making it produce fewer offspring carrying the parasite. 4. A new molecule tailored to kill Plasmodium: Till the day we figure out a better control method for preventing spread of malaria, effective treatment remains the mainstay for reducing the number of death cases. A recent study published in the Journal of Medicinal Chemistry has revealed that a protein called Heat Shock Protein 90 (HSP90) plays an important role in survival of malaria parasite. The study further analysed the potential of a group of compounds called 7-azaindoles that interfere with HSP60 and help in killing the parasite. Based on the laboratory results, it was concluded that 7-azaindoles effectively kill the parasite without affecting the red blood cells (RBCs). 5. A promising drug for cerebral malaria: Cerebral malaria is a common complication of malaria, where the parasite causes brain damage in malaria patients and creates life-threatening situation. Scientists at Toronto General Research Institute, Canada demonstrated that the drug rosiglitazone, used for diabetic patients, prevented brain defects in mice at the onset of cerebral malaria, and increased their chances of survival. If these results are replicated in humans, the number of deaths due to cerebral malaria can be reduced to a great extent.